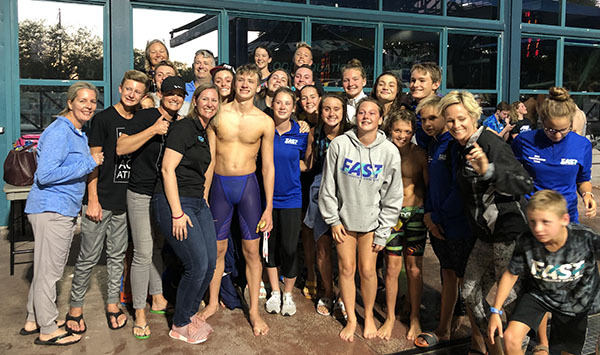 On Friday, March 22, Joshua Zuchowski, a freshman at the King’s Academy, broke the 13-14 National Age Group record held by five-time Olympic gold medalist Aaron Peirsol at the 2019 Spring International Championship meet in Clearwater. His time of 2:00.97 on the 200-meter backstroke broke Peirsol’s record by two seconds, qualifying Zuchowski for the 2020 Olympic Trials to be held in Omaha, Neb. Currently, Zuchowski is the youngest male qualifier for the trials at 15 years old. He is ranked second in the nation among all 18 and under swimmers this season. Shown above, Zuchowski celebrates with friends, family and swim club teammates.